Eastenders Spoilers: Hayley Slater Forced To Make Decision To Return? Eastenders spoilers indicate that Hayley Slater (Katie Jarvis) will soon show up in Walford again as she is forced to make a very big decision about her future. As a matter of fact, fans saw Kat Slater (Jessie Wallace) try to persuade Hayley to come back home during the Friday, February 8th episode. Here’s what you need to know. Hayley Slater is currently getting treatment for her mental health problems after she tried to kill herself by walking in front of a bus last month. She’s placed her baby in the case of Kat and Alfie Moon (Shane Richie) while she is getting treatment for her problems. They’ve agreed to take care of her daughter Cherry until she is able to stand on her two feet on her own. Unfortunately, Kat is starting to crack under pressure. She’s running out of money and she can’t cope with the stress of taking care of her three boys along with Baby Cherry. Seeing that she is crumbling under the surface, Mo Harris (Laila Morse) tells Kat the straight truth: she can’t continue to take care of everyone under the same roof. That’s when Kat decides to try and convince Haley to come back home. Unfortunately, Hayley might not be in the right mind frame to come home to take care of her daughter. But at the same time, if Kat is unable to take care of the small tot, then who will? This will force Hayley to make a very huge decision about her future. If she doesn’t decide something right away, it will impact everyone’s lives around her, including Kat the most. Of course, fans will have to tune in to find out what will happen next! In the meantime, let us know your thoughts in our comments section below. And as always, come back to Soap Opera Spy for all the latest news, updates and spoilers on Eastenders, Coronation Street and all of your favorite British soaps right here. 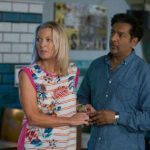 EastEnders Spoilers: Kathy, Masood Drop Surprising News, Will Ian Get In The Way Again?